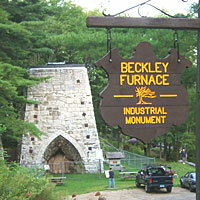 Ask us, tell us — let us hear from you about Beckley Furnace!! The easiest way to get in touch with us at Beckley Furnace is usually via e-mail. To contact us via e-mail, here is a functional directory. webmaster@beckleyfurnace.org — contact our Webmaster with questions about this website, the Facebook page, etc. When in doubt which address to contact, a message to info@beckleyfurnace.org will eventually get to the person who can best respond to your inquiry. We maintain an active Facebook presence. Find us at www.facebook.com/beckleyfurnace. You can communicate with us at our Facebook page using the normal Facebook messaging tools. Beckley Furnace is staffed only during limited hours (or when you might happen to find a member of the Friends of Beckley Furnace hard at work maintaining, researching, or restoring the facility). The easiest ways to contact us are via postal mail or via e-mail.